"Even before the first installment of the series, “Turmoil and Triumph,” had its debut last Monday, it was knocked by television critics for being too long and for treating its subject with reverence. Mr. Getler said he thought the “deification of Shultz” was both unnecessary and distracting." Check out the website of Turmoil and Triumph: the George Schultz Years here. Now, George P. Shultz, the 60th U.S. Secretary of State who served from 1982 to 1989 ( 6 years & 188 days, the longest tenure since Dean Rusk in the 1960s) has written a new book Ideas and Action: Featuring the 10 Commandments of Negotiations. 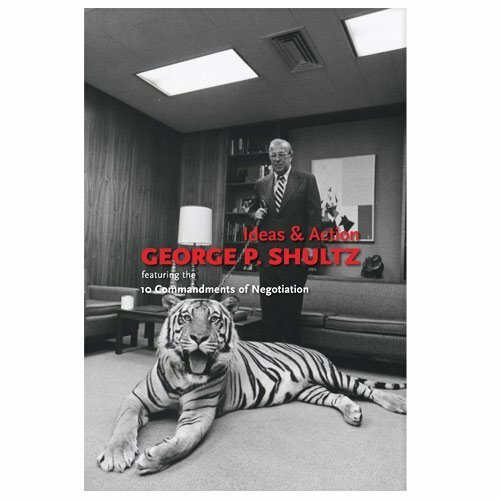 IDEAS & ACTION, Featuring the 10 Commandments of Negotiations, a new book by former Secretary of State George P. Shultz published by Free to Choose Press, is a fascinating, first-person account of lessons learned by one of America's most unique and admired public servants. In his long career in academia, business, and diplomacy, Shultz has spearheaded negotiations on labor disputes, arms control, and the release of political prisoners. Esteemed by Republicans and Democrats alike, Shultz served in the administrations of Presidents Eisenhower, Nixon, and Reagan. He was a Marine in the South Pacific during World War II, earned a Ph.D. in industrial economics from MIT, and was Dean of the University of Chicago's Graduate School of Business. As he says in the introduction to IDEAS & ACTION, "We have grown accustomed to drawing a bright divide between the world of ideas, a world dominated by ivory towers, and the world of action, a world dominated by oval offices, market floors, and fields of battle. My life and career, however, have known no such bright dividing line." Keys to good management -- Shultz shares insights gleaned from his vast experience as a labor negotiator, university president, and business leader, including the importance of letting employees know that their opinions matter and giving them a stake in outcomes, taking responsibility for decisions, and having a long-term strategy. Civil rights -- Shultz recalls his time as a labor negotiator in Texas in the early 1960s and as the chairman of a committee tasked by President Nixon with ending school segregation. Human rights -- Shultz recounts the delicate negotiations with Soviet leaders to obtain the release of dissident Soviet Jews, one of his proudest achievements as Secretary of State. Success in Negotiations: Ten Commandments -- Shultz imparts wisdom that has practical applications for all readers as he outlines ten principles for negotiations in work, business, and diplomacy. He illustrates each commandment with examples taken from his long career, from the Geneva and Reykjavik summits to the release of imprisoned American reporter Nicholas Daniloff, from the air-traffic controllers' walkout in 1981 to the war in Grenada, and more. A World Free of Nuclear Weapons -- Shultz continues to be a leading figure on the international stage. Along with Henry Kissinger, former senator Sam Nunn, and former Secretary of Defense William Perry, Shultz is a tireless advocate of nuclear disarmament. Mr. Shultz's publications include Putting Our House in Order: A Citizen's Guide to Social Security and Health Care Reform, with John B. Shoven (2008), Turmoil and Triumph: My Years as Secretary of State (1993), Economic Policy Beyond the Headlines (1977), and many more. The 3-hour DVD of T&T and the new book are available to purchase here. TAGS Book Notes, Legacy, Secretary of State, Where Are They Now?